5 Hole rod pulls for Sho-Bud Maverick pedal steel guitars. These are exact reproductions of the original 5 hole pulls and fit the Ø.312" (5/16") cross shafts. Pricing is for a quantity of 1 package containing the 3 components to make 1 assembly. 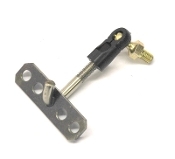 Rod, Link Assembly, LKL, Ball Joint Rod, Link Assembly, LKL, OEM Rod, Pedal, Ø3/16"
5/16" Hex cross shafts to fit Sho-Bud and Fender pedal steel guitars. Pedal pull cross shafts for Sho~Bud steel guitars with 2 hole pulls. Pedal return spring for Sho~Bud pedal steel guitars. Price is for 1 package which contains 1 spring.